Cygnus X-1 is a well-studied X-Ray source; the first one accepted as coming from a black hole. It is the brighter of the two stars in the center of the image. It belongs to a high-mass binary system about 6,100 light years distant in the constellation of Cygnus, and includes a blue supergiant variable star (HDE 226868) orbiting a black hole. A pair of relativistic jets emanate perpendicular to the accretion disk of the black hole. These jets create a radiative (bow shock) wave due to the jet traveling at >100 km/s. It is probably younger than about 40,000 years (Russell et al., Mon. Not. R. Astron. Soc, 376, 1341-1349, 2007). The curved bow shock structure shown in the image is the result of this jet interacting with a dense interstellar medium. It is not a planetary nebula or supernova remnant. Researchers have measured X-Ray bursts occurring at a time scale of a fraction of a second, which they claim is consistent with matter falling into the black hole. Cygnus X-1 is referred to as a microquasar. The curved bow shock front is about 10′ wide. North is up in the image. 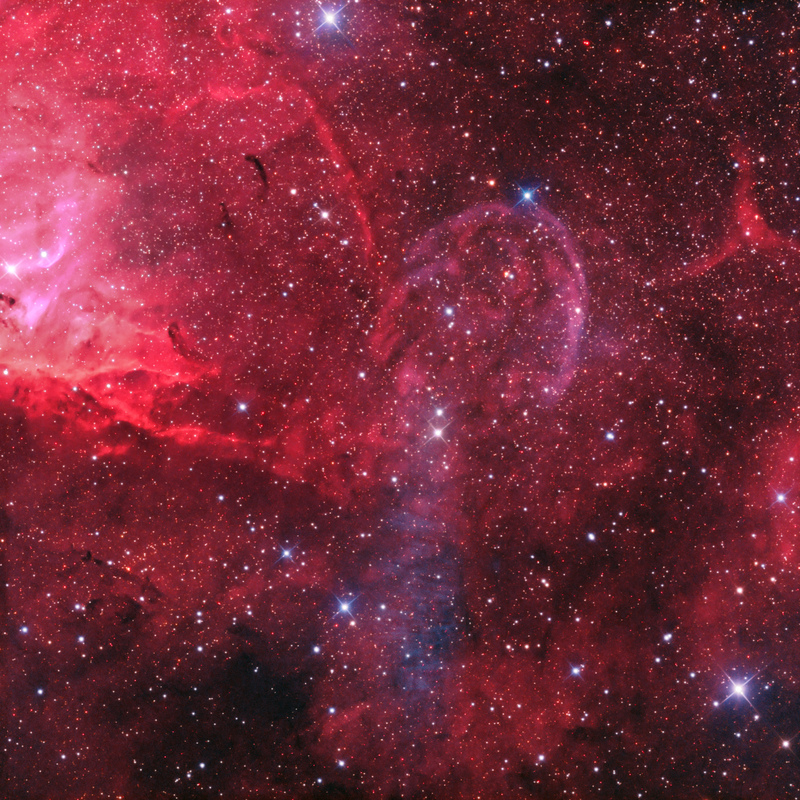 The bright area toward the left is part of the Tulip Nebula (Sh2-101). The southern jet has yet to be defined. Russell et al. indicated the need for deeper OIII images. There is a faint, elongated OIII-rich region in my image south of Cygnus X-1. Whether this corresponds to the location of the southern jet is unknown. It has some structure with horizontal dark and light ridges, suggesting that it is not an artifact in the nearly 5 hours (10 30-minute) of OIII exposures. There is an excellent, higher-resolution image with a mouse over of the bow shock, black hole and relativistic jets shown as the June 8, 2009 APOD.